Join us as we initiate the new wave of goth parties with revival of ALTERNATION, Singapore’s longest running alternative music night on record. Come 16th October, the interiors of DXO will drip macabre, melancholy and madness as befitting its patrons of eternal night. 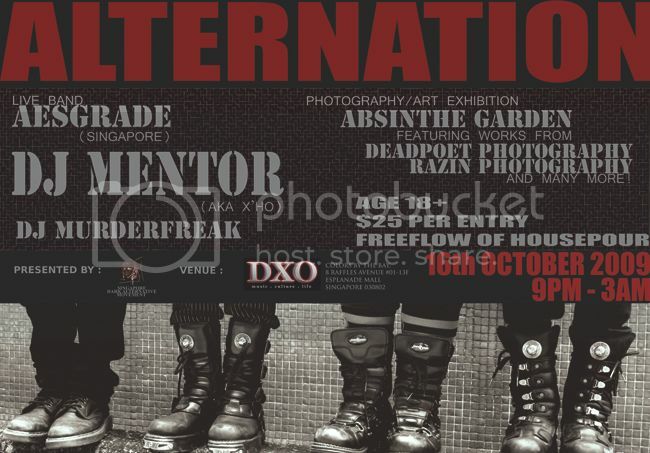 Hosted by Singapore Dark Alternative Movement (SDAM), the purveyor of Singapore’s only dedicated alternative music events, Alternation will feature, no holds barred, the sickest and harshest of Goth/Industrial/EBM from international club circuits. Those familiar with our goth parties will know this, but for the uninitiated, brace yourselves as our resident deckmasters MENTOR (X’ho) and MURDERFREAK unleash fiery inferno upon the dance floor. In addition, we bring you a more gothic goodness in the form of ABSINTHE GARDEN. This art exhibit is a non-profit effort on the part of SDAM to showcase local alternative talents to the general public as well as media. Proudly curated in the Nest of DXO, we have gathered for your pleasure, an eclectic mix of six active local artists with a penchant for twisted tragedy. When chandeliers cast their sultry glow upon their heartworks, each of them will take you down the road less travelled--if you will but keep an open mind. What the dark and alternative means to each artist converge into the tenet: Marrying the weird and the wonderful with positively no discrimination, while striking contrast to the everyday with wicked relish. RSVP your attendance at our Facebook page HERE!